The meaning of Pedelec is basicaly pedal controlled motor. Torque Sensing provides a sensor to measure pedal force and speed to deliver a proportional amount of power. In effect it amplifies your legpower. How much is up to you either in the force you pedal with, or the multiplier you program the computer for. For example, lets say the average rider pumping along at 10 MPH produces 100 watts. You set the program to 1X. So to reach 10 MPH, you pedal at 50 watts, and the motor produces 50 watts. When you produce 100 watts, the motor is producing 200 watts, and you're rolling 18-19 MPH. Likewise you might like 5X power up a 5% grade. With 100 watts in you'll be rolling about 15 MPH. Some motors like Bionix or Falco have a built-in torque sensor. Thun developed a Bottom Bracket that has an accurate Torque Sensor built in. 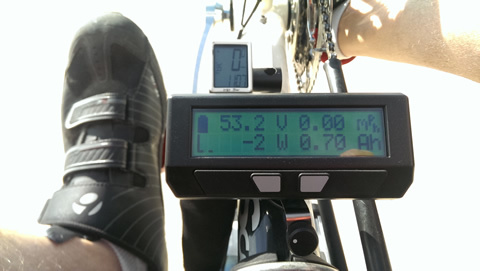 Adding the Cycle Analyst 3 (CA3) computer enables the Thun to control the motor while measuring rider output in Watts. The CA3 is designed and built specifically to monitor and manage E-Bikes and uses the Thun Bottom Bracket signal to control the motor. Hub mounted Torque Sensors are at the mercy of the gear selected as the torque forces vary with the gear ratio. Some of these systems have some speed compensation built in and that works pretty well. Thun Bottom Bracket provides a much more accurate way to measure rider torque. 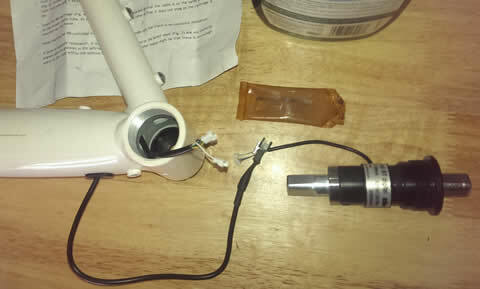 Thun Bottom Bracket has tiny pair of connectors that plug into a small harness. This boom already had holes drilled for wiring. The torque sensor is a non-contacting Hall Effect type sensor that accurately measures force input for each stroke. Those force levels are sampled several times a second to determine the value. Also there is a cadence sensor that sends 8 pulses per revolution; this is how the computer knows the cadence. Power output in watts is calulated by the computer from the speed and force values. Even without a motor, the Thun is very valuable to give rider valuable data about how much force they pedal with, and where the most efficient cadence is for a particular rider. Thun offers a square taper crank interface and accepts most square taper cranks. Cycle Analyst V3 (CA3) is the full-featured E-Bike computer that captures critcal power data relevent to E-Bikes. Connected to the Thun this unit includes an Auxilary Pot that controls the Torque Multiplier setting. Highly versatile, it is programmable either from the console or a PC. Full time backlighting make this a an excellent display for night time. There are over a dozen data screens that can read instantaneous values with some data stored. There are plug-in options to add GPS tracking and full data storage. As the CA3 was designed to be powered by an E-Bike battery, the minimum operating voltage is 12VDC. Typically a CA3 and Thun Bottom Bracket will cost about $150 each or $300 for the set. Basic power control is through a throttle which come in both thumb and twist control forms. Using a throttle alone isn't a bad way to go, but its not a Pedelec. Some Pedelecs use a cadence sensor on the crank which is more like having an on-off switch set to some constant level of power. Just doesn't feel natural. Anytime the throttle is used it overides the Torque Sensor control of the motor. Stop pedaling and almost immediately the motor cuts power; response lag is between 3-5 tenths of a second. Transition to power can be tailored to the rider's preferences quickly and easily. The Auxilary Pot adjusts the Human Torque Multiplier by 0~100%. So if Human Torque Multiplier was set to 5X and the Auxilary Pot was halfway, power to the motor would be half of 5X = 2.5X. Because your also controlling power with the pedal pressure, the rider still has motor power control anyway. If you're on a commute with a 15- 20 MPH ride, Torque Sensing is simply awesome. If you're trying to conserve power on hills, Torque Sensing will extend the ride. Riding up long 5-8% grades with 2.5X matches my 250 Watts with an additional 625 Wotor Watts, and my speed goes from 4.5 to 11 MPH. At anytime hit the throttle and it overtakes the Torque Sensing. Efficiency is a little better with Torque Sensing than Throttle for most people. Throttles take an extended effort of sensitivity as its more work. In Pedelec mode it feels more automatic for sure.